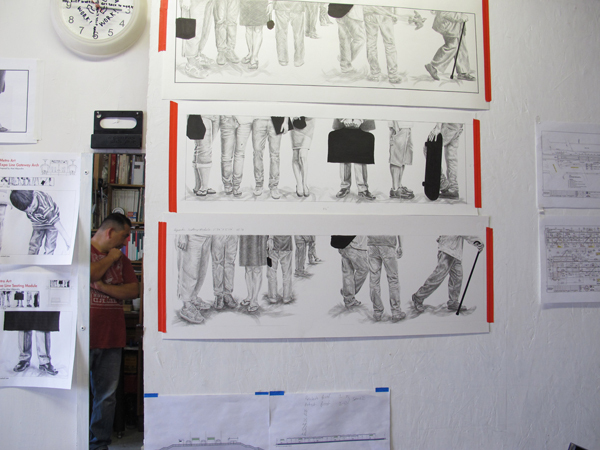 Artist Abel Alejandre in his studio. Photo: Todd Gray. This is the sixth in a series of Source posts providing a behind-the-scenes look at the artwork fabrication process for each of the seven new Metro Rail stations under construction along the second phase of the Expo Line between Culver City and downtown Santa Monica. The artworks will create a welcoming environment for future riders and connect the stations to surrounding neighborhoods. Commissioned artists include Constance Mallinson, Shizu Saldamando, Abel Alejandre, Susan Logoreci, Nzuji de Magalhães, Carmen Argote, and Judithe Hernandez. 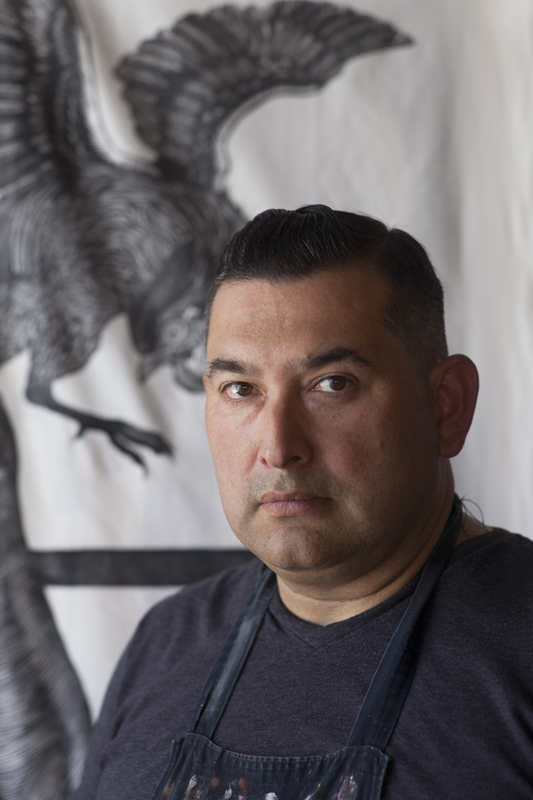 This post introduces the artwork of artist Abel Alejandre, which will be featured at the Westwood/Rancho Park Station. His original artwork, Panoramas, began as hand-drawn graphite drawings on paper. Artwork Description: Panoramas is a series of images in which each figure is purposefully placed to create a story of place illustrated through the act of commuting. Some art panels depict commuters calmly waiting, while others show the legs of travelers headed to their destinations — a business professional with her rolling briefcase, a parent with a stroller, a hummingbird in flight, among others. The standing figures combine styles of dress from the past as well as the present, collapsing time and place into a series of narrative stances. Individuals reference the history of the local area: a gardener holds a young boy’s hand as the boy reaches for a dropped origami paper crane, signifying nearby Little Osaka and the many nurseries that once flourished in the area. A wounded soldier in an older style of uniform stands on crutches, drawing on the memory of the Sawtelle Veteran’s Home. 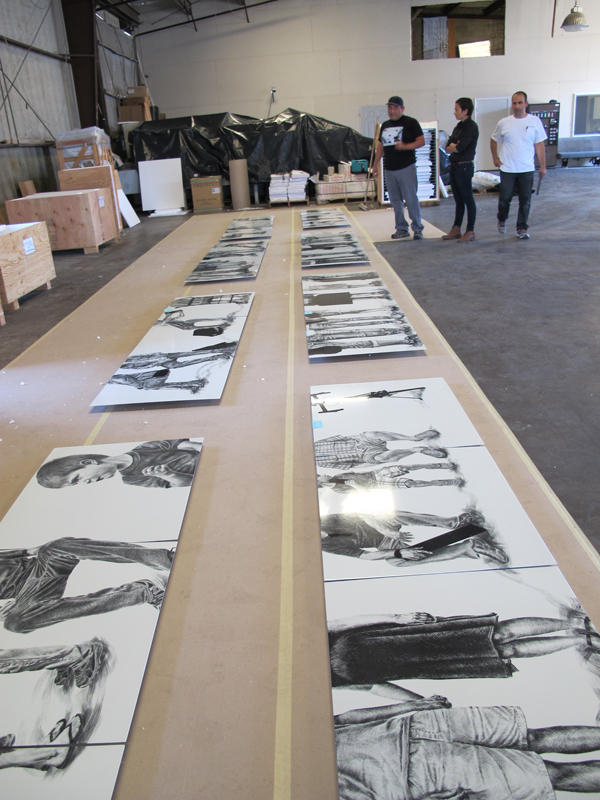 The artist’s graphite drawings for the Westwood/Rancho Park Station at his studio during a visit by Metro Art staff. The graphite drawings were translated into porcelain enamel steel by the artwork fabricator, Winsor Fireform, which specializes in that medium. The 12 artwork panels will be placed in steel frames and installed throughout the station’s platform in highly visible places for riders and the public. Alejandre is thoroughly involved in the process to ensure that the porcelain enamel is an accurate translation of his original artwork. Porcelain enamel steel is a highly durable material often used in transit environments as well as national parks and other outdoor locations. Because of its durable properties, the material was used in ancient Egypt on pottery, stone and jewelry and in modern times is used on everyday objects like cookware, dishwashers and washing machines. Porcelain enamel originates as powdered glass fired at a high temperature and fused onto steel. In addition to resisting heat, cold, and the intense Southern California sun, the versatile material also resists physical and chemical damage. Important for artwork in the transit environment, porcelain enamel retains color, and is easy to clean. It is glass, actually, not paint, so it resists fading. Click here for more information about the artist and here about his work for the Westwood/Rancho Park Station. 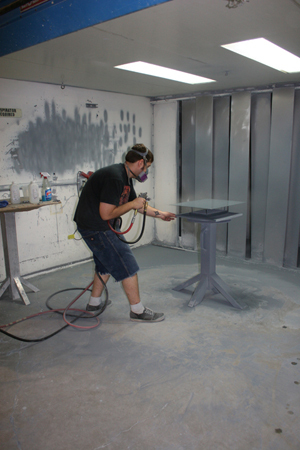 Winsor Fireform technicians preparing the steel and spraying porcelain enamel. Photo courtesy Winsor Fireform. 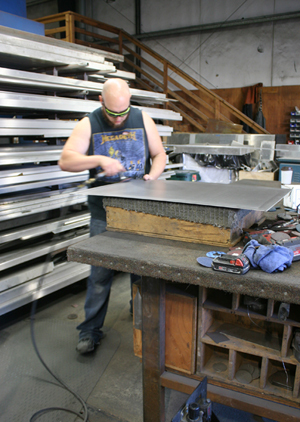 Two of the artwork panels at the fabrication shop. Photos courtesy Winsor Fireform. 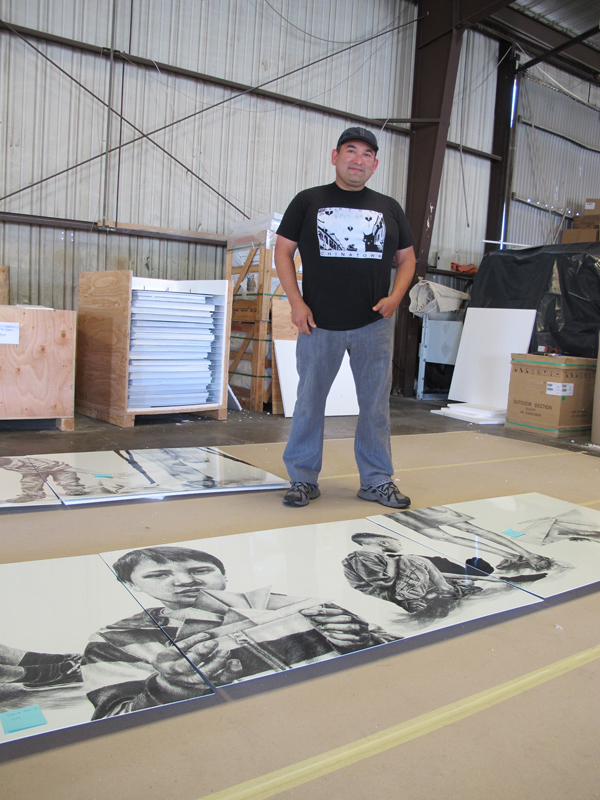 Abel Alejandre inspecting his artwork panels with Metro Art staff after they were delivered by artwork fabricator Winsor Fireform to ensure that his original artworks are accurately reflected, and that the black and white gradations are consistent among all twelve of the panels. The artist with completed artwork panels. The work looks so impressive Abel. I’m so glad you are learning about this new technical process. Happy Thanksgiving to you and your family. I would like to visit you during my Christmas break at the studio,my daughter and son wants to see your work in person. I’ll give you a call soon. I get out on the 19th of December. I’m so very proud of you !!! Relax and enjoy your holiday.